IT will probably be talked about for years to come. The day the President didn’t make it. Aogán O Fearghail from the GAA was expected to arrive at Ballinkillen last Tuesday morning to take part in the Active Flag launch in the school. Due to a communication mix-up, he never got there. Active Flag projects encourage children to take physical exercise and the initiative in Ballinkillen National School was an outstanding success. Over the previous 12 months children star-jumped, ran on the spot and jogged to hit their targets. Fifth and sixth-class children helped and encouraged the younger ones. The focus was on enjoyment and participation. It was good fun. On Tuesday there was a palpable sense of pride around the school. Guests included local TD Pat Deering, Carlow GAA chairman Sean Campion, secretary Michael Doran and other senior county board officers. Dual player Cyril Hughes who won a Railway Cup football medal with the Combined Universities and was on the Ballinkillen senior hurling championship winning team of 1973 was another man in attendance. This was acknowledgement of a special occasion for the school and the community. Retired and former school principal Kevin Cuddy came out from Carlow to lend his support. 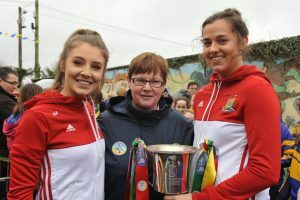 Michael Meaney, Carlow Coiste na nÓg chairman, was part of the large crowd, as were Ava Murphy and Kate Kinsella from the Carlow and Ballinkillen camogie teams. Many bystanders wore the blue and yellow of Ballinkillen. Noted musicians Eoin Quirke, Eoin Cummins and Thomas Donoghue shrugged off the inconvenience of the cold weather as these past pupils joined in with the younger musicians to provide the entertainment. Chairman of Carlow County Council John Murphy represented the county. While the GAA president didn’t arrive, there was no murmuring or grumbling. In a funny way, the situation showcased the parish in its best possible light. School principal Michelle Doorley just got on with it. In her speech she acknowledged the workings of a successful school, club and parish. Her delivery was warm and all embracing. 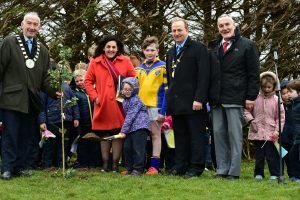 Then it was on to the nearby GAA club for the planting of a tree as part of National Tree Week. If the GAA President had turned up you can be certain Tom Kinsella, Cathaoirleach of Muinebheag Municipal Council, would have, at some point, taken the opportunity to have a gentle word in his ear. 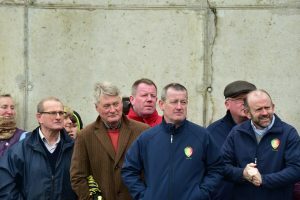 At county board meetings the Ballinkillen delegate vents his frustration at situations where his club struggles to get teams out for Leinster and Kilkenny league games while intercounty players stand on the sideline and are forbidden from taking part. Instead, his brief speech reminded those in attendance that two former pupils were on the Myshall team who had won the intermediate club camogie title in Croke Park two days earlier. “It is good to see the cooperation between school, club and community,” he emphasised. Fintan Walsh represented the National Tree Council of Ireland. Also present from that organisation was Kay Hartigan and 150 saplings were presented to the school and the community. In the cold, common sense prevailed as speeches were short. Then it was back to a warm hall where tea, sandwiches and cakes hit the right spot. It was a lovely show of strength from the community. 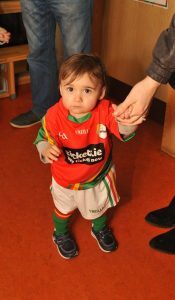 In recent weeks, the GAA President has been preoccupied with the annual Congress and the flak he and his organisation have taken in relation to the Super Eight, competition changes, All-Ireland finals in August and player welfare. Here he would have seen the workings of a small community where the GAA has a major and positive influence. The school, the club, the pitch, former hurling great Timmy Byrne and his small shop, they all make up an important part of the lives of people in Ballinkillen. In recent years the community organised the Blackstairs Cycling Challenge which is dedicated to the memory of Eoghan and Ruairí Chada. This sporting event goes from strength to strength. The cycle takes place on 23 April and, thanks to the energy of the Ballinkillen community, will attract a huge entry. The story of the absent President looks set to have a happy ending. It’s hoped Aogán O Fearghail will be in Ballinkillen today (Tuesday) at 10.30am. “It won’t be the big thing that was planned, but he will come down and meet the children,” revealed school principal Michelle Doorley.